Frequently Asked Questions about donkeys! If you would like to support the donkeys, donations of cash or feedstuffs (including carrots and ginger biscuits) are always appreciated. Should you wish to sponsor one of the donkeys on the Adopt-a-Donkey Scheme, we recommend a minimum payment of €15 a year for which you will receive a signed certificate of adoption, a photograph of your chosen donkey and two newsletters within the year of sponsorship. As a special gift for a relative or friend we will gladly include your personal greetings card, if you send it to us with an adoption application. Under most circumstances any of our donkeys and ponies may be sponsored under our Adopt a Donkey/Pony Scheme but it should be remembered that older animals have a predictably shorter life span and young healthy animals may be placed into foster homes without notice. For those of you not familiar with our friends here are a few suggestions. Joshua - a real boy, pushy, affectionate, used to getting his own way (with charm!) and loves nibbling buttons, zips, toggles, handbags and clothing; especially if he gets more cuddles that way. Tommi - a teenage donkey gelding with a slightly shaggy chestnut coat who came to us as a year old foal with a mild spinal problem. His best friend is Joshua. Perdido — meaning ‘the lost one’ was found abandoned on the road at 5 months old in poor condition . He is a little timid but still friendly. Most of the donkeys who come to the Sathya Sai Sanctuary are elderly. Many are ex-working donkeys who have laboured for years bringing in the hay and the turf, carrying the milk churns to the creamery and even ploughing and harrowing the fields. Nowadays this work is done by tractors and other farm machinery. They come to us from many sources: voluntary relinquishment when their owners can no longer care for them or have died; abandonment, when they are usually found loose on the road; or in cases of severe neglect or cruelty. The most common problems involve neglect of their hooves due to insufficient, inadequate and unprofessional trimming, plus keeping the animals in unsuitable conditions such as on wet, acid land with no recourse to somewhere dry. Other common problems include skin disorders such as mud fever and rain scald due to living out, without shelter in Ireland’s wet climate. Whilst native ponies have waterproof coats, donkeys are indigenous to the hot, dry climates of Africa and Asia and have no waterproofing in their coats. They unquestionably require a dry shed for shelter. Harness sores are rarely found these days but it is not uncommon to find a donkey or pony with rope burns or wounds on the face from having too tight a halter or headcollar left on permanently. On a young animal that is still growing this can prove disastrous. Occasionally we have donkeys, ponies and horses that we feel would benefit from being in a smaller group where they would get more attention from just one or two people and not have to deal with the many visitors we have at the Sanctuary. When these animals become available we offer them on our Foster Loan Scheme. This scheme works as a permanent loan of the animal to an individual or family who is prepared to abide by certain requirements laid down by the Sai Sanctuary. Many people have a misguided idea of what fostering is about. Almost all the animals that end up in a welfare situation have been neglected or traumatised in some way and many have a ‘history’ about which we have little or no information. The popular concept that quiet, easily managed, fully trained children’s riding ponies are available for free from equine rescue societies is a complete nonsense! Show quality ponies and horses are likewise rarely found in welfare situations unless they are aged or have been damaged in some way. Breeding mares, when available, come under our non-breeding policy. We ask, therefore, that anyone interested in fostering an equine long term, seriously considers whether they have the facilities, the time, the patience and the love to give to animals which have, in all probability, suffered at the hands of humankind and may be defensive, timid and untrusting. Almost all will make a full recovery and become loving pets given time and loads of TLC. Many youngsters may be viable for training for both riding and driving but will rarely arrive on your doorstep with these skills! It is highly recommended that you spend time visiting your chosen animal at the Sanctuary to get to know him/her and to ensure that you actually like each other as this is NOT an automatic guarantee! Inexperienced people will be required to learn the basics of equine care at the Sanctuary prior to delivery of their foster animal. 1. 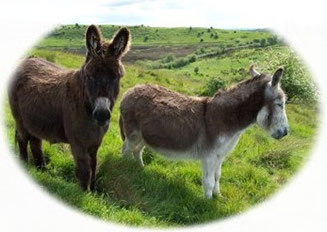 Donkeys are only ever placed in pairs as they are sociable animals who hate being on their own and are often noisy, become depressed, or develop into delinquent escape artists when they are lonely (sometimes all three)! 2. With horses and ponies preference will be given to a situation where other equines are already present as they too are sociable animals who, with a few exceptions, prefer company. 3. All applicants must agree to be homechecked prior to receiving an animal and be available for further checks, without notice, at any time in the future. 4. If for any reason the applicant is no longer able to continue keeping the animal(s) it must be returned to the Sai Sanctuary. It cannot be sold, rehomed or moved to other premises. 5. If, for any reason the Sai Sanctuary feels the animal(s) is unhappy or is being neglected or abused in the foster home situation, they reserve the right to remove the animal(s) without delay. 6. The Sai Sanctuary operates a strict non-breeding policy. All males are gelded prior to fostering. Any foal(s) born to a mare or filly while in the foster home belong to the Sai Sanctuary and are covered by all the same policies as above. If you feel you can work with all of the above and wish to become a Sai Fosterer in Southern Ireland , please complete the form below and either email to sai.donkeys@gmail.com or post to: The Sathya Sai Sanctuary, Castlebaldwin, Co. Sligo.